Among various cellular factors contributing to protein misfolding and subsequent aggregation, membranes occupy a special position due to the two-way relations between the aggregating proteins and cell membranes. On one hand, the unstable, toxic pre-fibrillar aggregates may interact with cell membranes, impairing their functions, altering ion distribution across the membranes, and possibly forming non-specific membrane pores. On the other hand, membranes, too, can modify structures of many proteins and affect the misfolding and aggregation of amyloidogenic proteins. The effects of membranes on protein structure and aggregation can be described in terms of the “membrane field” that takes into account both the negative electrostatic potential of the membrane surface and the local decrease in the dielectric constant. Water-alcohol (or other organic solvent) mixtures at moderately low pH are used as model systems to study the joint action of the local decrease of pH and dielectric constant near the membrane surface on the structure and aggregation of proteins. 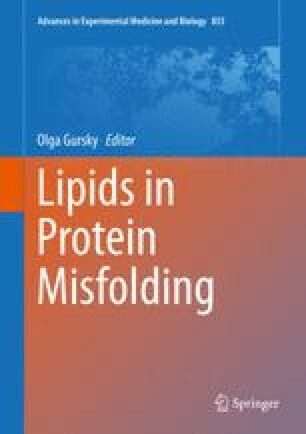 This chapter describes general mechanisms of structural changes of proteins in such model environments and provides examples of various proteins aggregating in the “membrane field” or in lipid-mimetic environments.